Hoops: Boys and Girls player of the year? Boys and Girls first team? Coaches of the year? First team (any combination of five, can be three guards, two forwards; two guards, three forwards or a traditional two guards, two forwards and a center). Bonita photo gallery, last team standing: The Bonita girls basketball team will face Orange Lutheran in the CIF-SS Division 3A championship on Wednesday at the Anaheim Arena, 8:30 p.m.
Don’t get me started with this, if CIF is concerned with behavior, they should start with head basketball coaches, by far the most animated, brutal on officials and capable of inciting a crowd more than any other sport. Baseball is probably second, yet they go on how brutal soccer coaches are on refs. Talk about a double standard? Soccer, more than any other sport, has strict rules when it comes to cautions and ejections, which obviously leads to more ejections than any other sport. 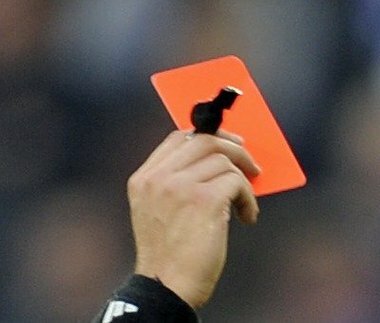 If a player fouls out in basketball with five fouls, that’s the equivalent of a soccer player getting a yellow, then a red for persistent fouling. Also, when a basketball player gets called for a flagrant foul, or a football player a 15-yard penalty for an unsportsmanlike conduct, that’s nearly the equivalent of a soccer player getting tossed for a hard foul. Show me the stats of how many basketball players foul out, or football players receiving unsportsmanlike penalties, then we can discuss this. And before they single out players and coaches so quick, maybe they should consider the quality of officiating too. In my opinion, this release shows a lot of unfair bias toward soccer, not intentionally — more a misunderstanding and overreaction to something that isn’t as serious as they think. Maybe CIF should impose rigid soccer-type penalties on coaches and players in other sports for berating officials, you would see the ejections increase rapidly. If anything, soccer has the strictest rules of all sports when it comes to penalizing behavior, that should be applauded, not threatened with probation. WHERE’S THE LOVE FOR SOCCER? High School soccer is flourishing in the Southern Section: fully 80% of our schools field boys and girls teams. We’re delighted so many students participate in a sport that is rigorous and demanding. We now offer a Southern California Regional Championship. One would think that the sport is enjoying strong, positive support from our school administrators. That is not necessarily true. (To continue click thread). At Anaheim Convention Center, 8:15 p.m.
Bonita’s Nikki Wheatley might be the best freshman I’ve ever seen. At least it feels like that after the performance she delivered tonight. Wheatley helped the Bearcats rally from a 30-26 halftime deficit, scoring 19 of her game high 26 points in the second half to lead the Bearcats to a 65-53 win over Amat and their first appearance in a championship game next week. Bonita won with a solid effort from their big four, who all finished in double figures. Taylor Anderson poured in 17 points and Madison Zylstra and Brianna Kennedy scored 11 each. Amat was paced by Vianai Austin (17 points) and Leeah Powell (16 points). Andrea Villanueva chipped in with 13 and Leticia Galarza had 7. That was it, four players from both teams providing all the scoring. When it was over, I followed the celebration on my little flip cam and talked to Wheatley, Anderson and Bonita coach Darrin Baumunk. It’s great stuff, check it out. TEMECULA — South Hills’ Vincent Herrera, Glendora’s Haydn Scharbrough and Santa Fe’s Joey Davis had the CIF State wrestling championships as their seasonl ong goal. They achieved it Saturday, while also adding the tile of CIF-Southern Section Masters champion after scoring individual titles at the CIF-SS Masters Meet at Temecula Valley High Schoolon Saturday. The trio topped a list of 18 locals who earned trips to next weekend’s state meet, scheduled for Friday and Saturday at Rabobank Arena in Bakersfield. The three champions followed up victories at the divisional finals with Masters titles, with Herrera winning at 119 pounds, Scharbrough at 145 and Davis, the No. 1 wrestler in his weight class, at 152. La Habra’s Elder Cruz was runner-up at 215, losing to state No. 1 Tank Knowles of Calvary Chapel/Santa Ana. Also qualifying for the state meet were South Hills’ Thomas Morales (sixth at 130), Jeff Vargas (sixth at 215) and Peter Nonu (sixth at 285); Northview’s Gilbert Nakatani (seventh at 119) and Bryan Salinas (seventh at 135); Chino Hills’ Christian Martin (sixth at 103) and Brody Goens (seventh at 171); Rosemead’s Matt Fregoso (fourth at 125) and Alberto Flores (ninth at 135); Arroyo’s Christian Betancourt (fourth at 112); Alhambra’s Hugo Perez (eighth at 112); Covina’s Kyle Acevedo (fourth at 130); West Covina’s Brad Ojala (eighth at 152); and Diamond Bar’s Brian Ryu (fourth at heavyweight). West Covina High School made history Saturday. 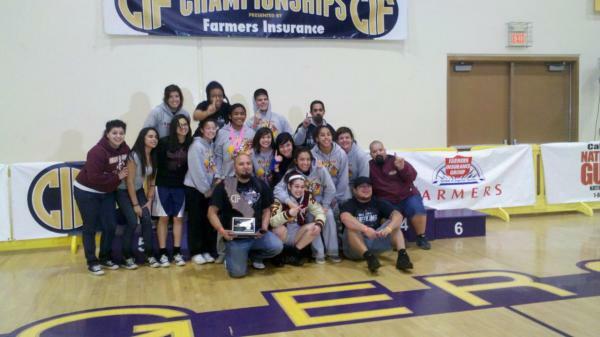 The Bulldogs, paced by junior Samantha Ortiz, won the first CIF State girls wrestling championship at Lemoore High School. “It’s a pretty cool feeling,” West Covina coach Sergio Ortiz said. “They worked really hard. They wrestle just like the boys. Samantha Ortiz, one of the top competitors in the state the past few seasons, was the only area wrestler to win an individual title. The junior had two victories by fall before getting a 4-2 victory in the 114-pound weight class finals. She scored a takedown with 10 seconds left in the third period to secure the title. West Covina’s path to the title was also paved by Jessica Vasquez (146), who upset the No. 1 seed before losing in the finals. Northview’s Vanessa Gomez was second at 105. Damien misses 3 at buzzer: Harvard-Westlake’s Damiene Cain and Jordan Butler scored 17 points each and Zena Edosomwan blocked a Calvin White 3-pointer at the buzzer as the Spartans lost in the semifinals for the third consecutive season with a 59-56 setback to the Wolverines in a Division 3A game at Calabasas High School. La Verne Lutheran staged a furious fourth-quarter rally against visiting Price in the CIF-Southern Section Division 3AA boys basketball semifinals at Citrus College on Friday, but the Trojans attempt to advance to a fourth straight divisional final came up short, 63-58. (To continue click thread).